You may have come to know us through a trade show, an internet search, the LPW educational web site www.laserplasticwelding.com or a referral from a colleague. We are glad you are here. It’s easy to come up to speed on the fundamentals of LPW. We recommend you spend some time at the educational site www.laserplasticwelding.com to orient yourself to the core principals of LPW, the terminology, material selection guide and the design principals. We also would like to spend an hour or two with you going over the process and design guidelines. That can be accomplished over the internet, one-on-one with a LPW expert, in person at your facility or as part of a lunch-and-learn seminar. The choice is yours; whatever works best for you. 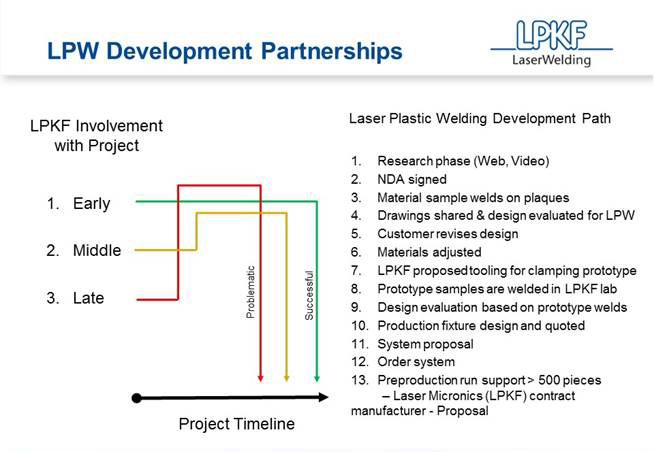 Once you are orientated, designing your first laser weldable joint is pretty straightforward. LPKF LPW experts will review your first drafts and recommend changes or enhancements to the design. Our end goal is an efficient design that can be easily molded and welded in the quantities needed. Prototypes are welded from first articles using prototype fixtures run on our development laser systems in the U.S. or at our global headquarters in Fúrth, Germany. Prototyping is a manual set up process and can support up to ~300 units, depending on the complexity of the part design. Running prototypes also allows us to determine cycle time, which is needed to match production volume to machine model (see next section). Two different fixture types are used during the development process. The first, the prototype fixture, is a low cost, simple machined fixture, most likely using an acrylic plate for the first article test welds. This phase will test the rib design for weldability and establish the preliminary welding parameters. You may test parts for strength using pressure bursting for enclosures, Instron pull/push testing and sectioning for visual weld evaluation along the length of the weld. Production fixtures are designed after all are satisfied with the tests from the first article welds and final designs are frozen. Upper clamping fixtures and lower workpiece carriers are part specific and are designed by LPKF to fit the parts and the production machine. A solid model of the frozen design and molded parts are needed to design and produce the fixtures. Parts are used to make sure the fixtures mate well with the parts. 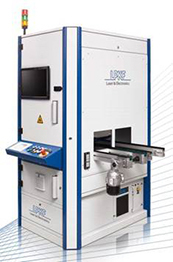 We will also specify and quote the specific laser welding machine and options necessary to meet your production ramp up and final annual usage requirements. We consider initial volumes and ramp up schedule to propose a cost-effective solution that meets your need for product introduction and accommodates the ramp ups or jumps in demand. 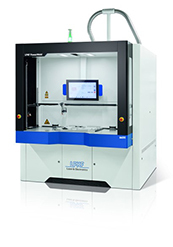 If your product requires automation to assemble LPKF works with your preferred integrators to co-design a welding solution that integrates into linear track, rotary table, 6-axis robots, pick and place robots and additional assembly workflows to meet your joining and assembly needs. Possible configurations could include: Power Weld 2600 with internal rotary table. 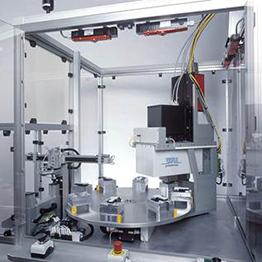 Double clamping nests for two-up serial welding of smaller parts can cost effectively increase throughput on one machine, Figure 1. InlineWeld 6600/6900 for integration into either a standalone welding workflow shown in Figure 2 and 3 or as part of an automated assembly workflow, as in Figure 4, are other possibilities. Prototype fixtures can cost from a few hundred dollars to a few thousand. Lead times for a simple fixture run 2 - 3 weeks. Larger fixtures; 6 – 8 weeks. A solid model of the assembly is needed to design and produce a prototype fixture set. A frozen design, solid model is needed for designing and producing the production fixtures. These are built at the same time your machine is being built. Lead time for production machines is currently running 16 -18 weeks. 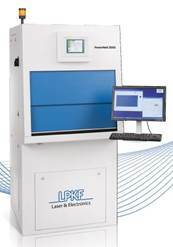 Design consultations, fixture designs, machine selection and integration design, in conjunction with an integrator, are all part of LPKF’s presales support. Preproduction runs and evaluation parts when you need more than 10 -20 parts are quoted on an hourly basis of $200/hour lab time. This is negotiated on a case by case basis and we are willing to work with you on sharing costs – depends on the complexity and degree of difficulty in expanding production on prototype fixtures. Preproduction runs of >500 pieces are contracted through our contract manufacturing division, Laser Micronics, in Fúrth Germany using your production fixturing in most cases. At the right place to get started! Keep me posted on when and where production for this program will begin.